Denver, Colorado (CNN) - Two-thirds of people who watched the first presidential debate think that Republican nominee Mitt Romney won the showdown, according to a nationwide poll conducted Wednesday night. While nearly half of debate watchers said the showdown didn't make them more likely to vote for either candidate, 35% said the debate made them more likely to vote for Romney while only 18% said the faceoff made them more likely to vote to re-elect the president. CNN Fact Checks: What was truth, and what was not? "This poll does not and cannot reflect the views of all Americans. It only represents the views of people who watched the debate and by definition cannot be an indication of how the entire American public will react to Wednesday's debate in the coming days," cautions Holland. "That indicates that the sample of debate watchers is about four points more Democratic and about eight points more Republican than an average CNN poll of all Americans, for a small advantage for the Republicans in the sample of debate-watchers," adds Holland. The poll suggests that the debate didn't change opinions of the president. Forty-nine percent of debate watchers said before the debate that they had a favorable opinion of Obama, and that number didn't change following the debate. "Romney's only Achilles heel may be the perception that he spent more time attacking his opponent than Obama, which may explain why two-thirds of debate-watchers said that Romney did the best job but only 46% said that he was more likeable than Obama," says Holland. 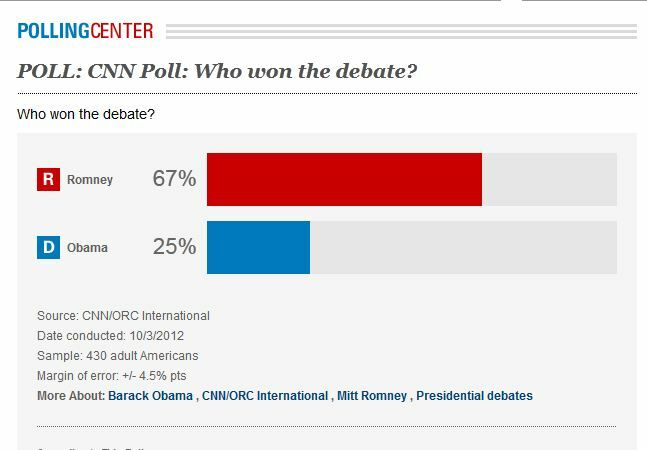 The CNN poll was conducted by ORC International, with 430 adult Americans who watched the debate questioned by telephone. All interviews were conducted after the end of the debate. The survey's sampling error is plus or minus 4.5 percentage points. So the moderator allowed Romney to have the last word most of the time and cut Obama off. He must be getting too old to do this. Put him on Ss and Medicare and get someone younger. America has not evolved yet- we are still a young country. All Englands political parties are to the left of either of ours. Most of the developed world would not have bought Romney's arguments, but America may. Obama ran into a faster talker than he and couldn't react. He stuttered, paused more than usual and looked foolish. He was destroyed... I voted for Obama last time... He's going to have to cure cancer this month before I'd do it again. I thought Romney got clobbered, and who are the spinmeisters to tell me any different? I know what I saw with my own eyes. Obama has spent many fortunes trying to demonize Romney, then fizzled flat when he had to bring the discussion face to face. Wow, I'm Canadian and I can't believe that Obama backers have the outright gall to accuse Romney of lying!? If lying person is not tobe voted for then Obama is the last person that should be president. Your predicting that Mitt will lie...Obama HAS lied over and over...Guatanimo Bay...Arizona killing not religiously motivated...Stevens murder not terrorists...didn't know his reverend for 30 years hated America. C'mon, seriously? I must have watched a different debate. 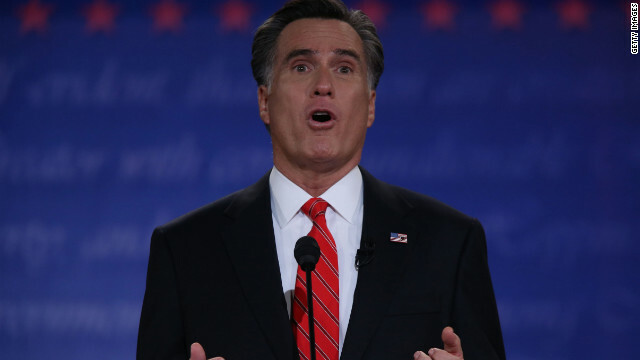 Romney lied through his teeth and acted like he was overdosing on red bull. This is what makes a winner? Yeah and Obama has never run a lemonade stand and that has never been more obvious than tonight. Maybe your messiah can ram through a law allowing pre-written speeches with teleprompters for the next round. Romney took it to the President and the President just looked like a school boy. At least someone spoke with some substance out there, and that would happen to be Romney. There is no way that Obama can compete with Romney on the subject of Economics, considering that his background is in law, while Romney has experience money, whichever it may truly be. The two debating on the matter in honest matters showed Romney to be the more prominent one of the two and to say that Obama seemed as if he had just come out of Economics 101, repeating terms and reciting common fact on terms, while on the other-hand, Romney actually seemed to be analyzing information, giving details on as to how to fix the problem. Of course, if the matter were to be turned on law and matter's lawfulness, then naturally Obama will have the advantage, but no. Though the president is part of the Executive branch where a duty is to enforce the law, our country at the most is not suffering from laws or lack of laws but rather our "economic crisis." Romney spoke the most precise of the two based on content and meaningfulness rather than the old emotional appeal that is typical of Obama, but then again in the end, words are words. Only a fool or dishonest person would say Obama won this debate. I see comments about the CNN poll being biased.. You got to be kidding me. CNN is one of Obama's biggest cheerleaders.... It has been a great night..